Technology has always progressed at a rate far faster than state laws can keep up with, which is why it can come as a surprise that certain things you’ve been doing are completely illegal. Now that everyone has a camera, it’s hard to know what’s allowed and what’s not allowed. More than that, it’s hard to know which laws are going to be enforced and which ones are really in theory only. If you live in California and have a home security camera, you may want to learn more about the official rulings of what you’re allowed to do and what’s off limits. 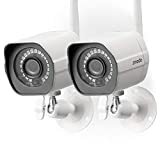 The idea behind home security cameras is that it’s a person’s private property upon which they’re placing the camera, and they have the right to protect their property. However, there are plenty of privacy laws that undermine behind this very basic fact, making the law much more complicated to someone who wants to take a magnifying glass to it. In order to violate California state law regarding home security camera laws, you would need to intrude upon another party with the help of your private camera. So what does that exactly mean? What exactly constitutes an intrusion and how can you avoid it? Well, like anything in life, it’s not all black and white but there are a few things you can keep in mind. Cameras have advanced to the point where they can capture an awful lot of information, both via visual and audio context. While most people in or outside your home are probably just talking about curtain arrangements, you could technically stumble upon something that’s far more scandalous. And some people might want to exploit the details they hear for their own gain, which really isn’t something that state law wants to get caught up in. The United States isn’t a police state, and people do have the right to a reasonable amount of privacy. The laws in California are quite clear when it comes to taking video of people in private areas. It may seem like a fairly obvious tip to let you know that you’re not allowed to put video cameras in bedrooms or bathrooms, but this rule is definitely not always followed by those with security cameras. The basic idea is that you need to let people that you’re taking video of them wherever they are. As long as you’re upfront about it and you’re not putting the cameras in a place that would violate privacy rules, then you should be ok. If you have any further questions about what constitutes a violation and what’s perfectly acceptable, call Protect America today. It’s our goal to give you all the information and help you need to both keep your home safe and stay within the letter of the law. The last thing you need is to make a truly innocent mistake and have it be interpreted as a threat to someone else’s security! To learn more about our organization give us a call today or request a free quote to see how affordable it can be. See why we’ve been the leaders in home security for more than 25 years.